Meningitis is basically an inflammation of the meninges. 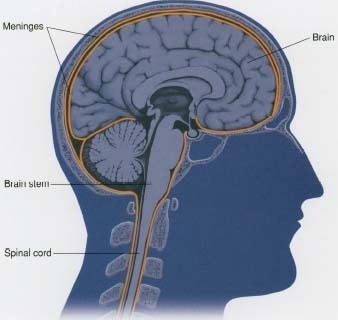 Meninges are the membranes that cover the brain and spinal cord. Mostly it is caused by bacteria or viruses but it can also be caused both by the use of certain medicines and illness. Viral meningitis is less serious and less common. It often remains undiagnosed as its symptoms resembles to those of common flu. Bacterial meningitis can be serious and life-threatening but it is rare. Meningitis is common among students, teens and kids. Meningitis can be treated successfully, if dealt with promptly. It is important to seek medical care right away to get routine vaccinations. Bacteria and viruses that cause meningitis are common and are associated with other illnesses. Bacteria and viruses that infect our skin, respiratory or gastrointestinal tract and urinary system can spread by our bloodstream to the meninges through the fluid that spreads in and around the spinal cord-cerebrospinal fluid. In some cases, bacterial meningitis can occur through trauma or any local infection like ear infection (otitis media) or sinusitis (nasal infection) which causes the spread of bacteria to the meninges. In newborns, bacterial meningitis is caused by Group B Streptococcus, Escherichia coli, Listeria monocytogenes while in older kids, Neisseria meningitides (meningococcus) and Streptococcus pneumoniae (pnemococcus) causes bacterial meningitis.